1. Preheat the oven to 170°C, gas mark 3. Make slits in the veal with a small knife. Wrap a piece of sage around a slice of garlic and push into the slits in the meat. Season the meat. Heat the oil in a medium flameproof casserole and brown the beef on all sides over a high heat. Add the wine and tomato paste, bring to the boil and cover the pan. Cook in the oven for 1½ hours until tender and cooked through. Leave to rest for 15 minutes. 2. While the veal is cooking, cook the potatoes in a large pan of boiling water for 15–20 minutes until tender. Drain thoroughly and return to the pan. Mash until smooth then stir in the feta with a couple of tablespoons of the oil it comes in, plus the olives and seasoning. 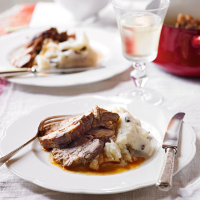 Serve with the sliced veal and the pan juices spooned over.